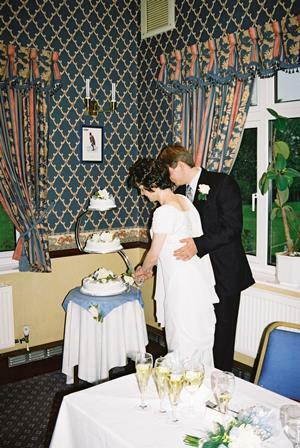 The few days in the run up to our wedding day were quite hectic and I did not feel well. Rob was away on the Thursday night so I made sure I got an early night, but I could not sleep and was up really early on the Friday. On the Friday morning, Mum and I started talking about my grandad and we both got upset. There was quite a bit to organise when Rob got back, but he was tired too as he had had a stag party the night before – he looked like I felt! I tried to rest between doing things, but my mind was too active and I was sure there was something I had forgotten. I dosed up on painkillers and anti-emetics and somehow got through the day, but I felt awful and was concerned that I would not be up to the wedding the following day. I got to bed about 11pm as my chief bridesmaid was still doing my nails until then. Amazingly I did sleep and woke the next morning when my dad brought me a cup of tea and my birthday presents. I sat in bed opening my cards and presents before getting up to start a busy day. I still felt pretty rough. The bridesmaids had to be at the hairdresser’s for 10am; I decided to go a bit later as I was going to be done next to last. It was 1.45pm when I left the hairdresser’s, my mum did not leave until 2pm! My dad rushed off to the car wash as my brother (the best man) was driving Rob to the church in their car. We managed to get something to eat and then about 3pm people started to arrive at the house; I was still in my jeans and t-shirt. When the bridesmaids arrived I helped them to get ready and then they helped me to get ready. Amazingly we were ready in time and the bridesmaids went off to the church and I waited for the car to come back for my dad and me. At this point I began to get a bit nervous, but I felt OK, I had taken some more painkillers. As we left the house a lot of the neighbours were watching, I felt a bit self-conscious, but I would have been looking out of the window if anyone else in the street was getting married. The journey to the church only took a few minutes. My cousin (one of the ushers) was standing in the church doorway; he gave me a big hug and told me I looked lovely, I thought I was going to cry! I managed to pull myself together and walked inside to be greeted by the vicar. Walking down the aisle I kept looking straight ahead, as I knew everyone was looking at me. When I got to the front I was shaking! The service itself went really quickly. 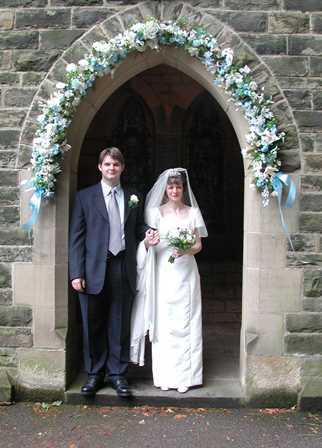 The vicar had put some chairs at the side of the aisle so we could sit down in between our vows etc. ; this was really helpful, as I would not have been able to stand for the whole service. Once we had said our vows I was shaking less! When we went in to sign the register Samantha, my chief bridesmaid, told me to relax; she said I looked really uptight, but I did not feel it. Walking up the aisle all I could see was a sea of faces, all people that I knew, looking at me, smiling. Once we got out of the church everyone descended to take photos and throw confetti. My grandma threw fresh rose petals from her garden. The weather then began to deteriorate so we decided to go to the reception before it rained. It began to rain just as we arrived at the reception, so we were not able to do any outside photos as planned, but we got some good ones inside. Once we had greeted all our guests and everyone was seated we had the speeches. They were all very good. Rob had managed to get a birthday cake for me without me knowing and that was brought out and everyone sang Happy Birthday! After the speeches we were supposed to cut the cake, but we forgot!! We did it after the food and no one knew we should have done it before! The room was then cleared and the DJ set up for the disco. 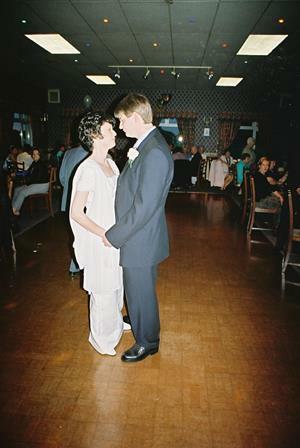 Rob and I had the first dance to ‘Wind Beneath my Wings’, my choice. I was not able to dance much, but did get up occasionally. We both went round talking to people. 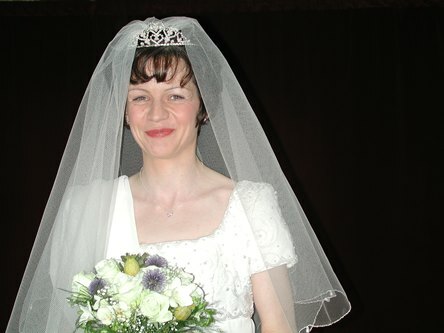 Just after the start of the disco I changed out of my wedding dress as it was getting too heavy. I did not want to take it off as I like it so much and know I will never wear it again. Everyone seemed to enjoy themselves and more food was brought out later in the evening. By this time, I was quite tired and was sitting with some family friends. A lot of people were dancing and having fun, I wanted to be with them, but knew I could not. Eventually we got a taxi to our hotel. It was lovely, but our room was right at the top, three flights of stairs! The room was huge, but very hot. Neither of us was able to sleep due to the heat and the excitement of the day, even though we were both very tired. By 6am I was fed up with lying in bed so got up and made a drink and took some painkillers, hoping they would help me to sleep. At 7am I got up and had a bath to see if that would ease the pain. Then we went down for breakfast; we are both quite hungry as neither of us had eaten much at the wedding. Later in the day we opened all our presents; we got far more than we ever imagined, people were so generous. Then it was time to get ready for the honeymoon. Amazingly I survived all this without feeling too bad, I do not know how I got through it, it must have been adrenaline that kept me going. For our honeymoon we went to Switzerland on a lakes and mountains train tour. We were not sure how I would cope as it involved quite a bit of travelling. It went quite well, although we could not do as much as we wanted to as I cannot walk very far. There was so much we could have seen, but had to miss. The first stop on our tour was for three nights at a hotel in Hilterfingen, next to Lake Thunnersee. We had a lovely room with a balcony overlooking the lake. The food was excellent and the hotel was lovely, the only problem was the bed was really uncomfortable! Whilst staying in Hilterfingen we went on a boat trip on the lake, the boat stopped right outside our hotel, and we went by train to Bern, Switzerland's capital. The next stop on the tour was Zermatt, home of the Matterhorn. The good thing about the trip was that your luggage was transferred between all the destinations, so we did not have to carry heavy cases. A husband and wife, who were very hospitable, owned the hotel in Zermatt. The hotel itself was in a back street and the room was very dark, the bed was comfy though! The food again was excellent and all freshly cooked. While staying here we went on trains and cable cars up some of the mountains. One day when we were up on the top of a mountain Rob decided to walk across some snow to take a photo, but as soon as he stepped on it he sank up to his knees!! Another day we had to walk across a snowy path and I had sandals on! The weather was very hot, but high up in the mountains it was quite cold and there had been recent snowfalls. They were getting ready for the summer skiing season. The final leg of the tour was a full-day train journey across Switzerland to St Moritz. The views are amazing, everywhere is so beautiful. We had a meal on the train too. The hotel in St Moritz was very nice, but the food was not very good – it was a canteen type service; the best things were the salads. From here we visited St Moritz and went up another mountain by train. We had a great time, but would have liked to be able to do much more. I could manage to get to places as travelling on the trains was quite restful, but I could not walk around when we got to anywhere. The same with the cable cars: it was a case of getting to the top and then sitting to admire the view, we could not explore. When we were in the hotel I spent all the time laying down and was in bed by 8pm every night; it was the only way I could cope with the sightseeing. The good thing about the holiday was travelling by train meant we could see things without it taking too much effort and I could sleep on the train if need be, although I did not like to as I did not want to miss anything. Having the luggage transfers was brilliant, as we could not have managed the cases ourselves. Being looked after for ten days and not having to worry about cooking, cleaning or washing was a great relief to me and meant that I did have the energy to get out. 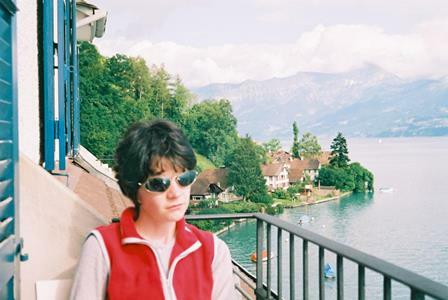 Switzerland is a very beautiful place and I would recommend it to anyone. The type of holiday we went on is excellent and a good way to see different places. Getting married has been a great experience, but has not been easy; there is a lot of preparation and a lot of stress trying to get everything right and keep everybody happy. It was difficult for me to ask for and accept help as I used to being so organised and independent and doing everything myself. I was very lucky to have all the help, but it was very frustrating at times. I struggled with some of the things I did get involved with, like making the favours, as my fingers were too stiff to do the delicate tasks. It is difficult to say if the wedding had any effect on my M.E. as I have been ill throughout and it is impossible to know if I would have been better without the stress. Obviously some days I did make myself worse by doing too much, but it could not be helped. Being married is great, but I am feeling quite depressed, which makes me feel guilty. All the time we were planning the wedding I had that and the honeymoon to look forward to, but now the future is a blank, nothing to aim for, nothing to look forward to. We hoped that as we prepared for the wedding, my health would improve and this was something of a goal, but it did not happen. Everything now is so uncertain and I have the difficult task of making decisions about work and whether to risk starting a family. I really want to work, but lost my job just before the wedding and my health is not good enough for me to be able to work. I also want to start a family, but do not know what effect that would have on my health and whether I could cope looking after a baby on my own. My gut feeling is that I would not cope, but it is something I really want! 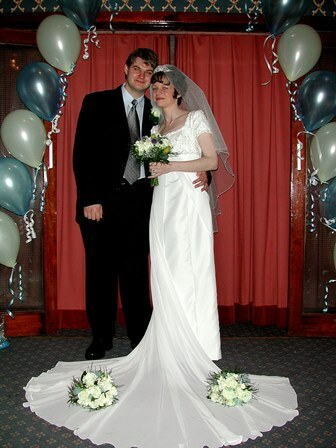 We are fast approaching our 12th Wedding Anniversary (where does the time go?). In the last 12 years we have had many ups and downs and many strains on our marriage. We started trying for a baby after we got married and sadly nothing happened. After many tests for both of us, which were inconclusive, we were referred for IVF treatment and we got a start date of September 2005. The day we were told we could start treatment my grandad died so it was a time of mixed emotions, and as we had decided not to tell people about the treatment it was very hard. Our first treatment failed, but we had four frozen embryos so decided to try again in May 2006. On my 35th birthday and 5th wedding anniversary, I got a positive pregnancy test. Great news, but our happiness was short lived. 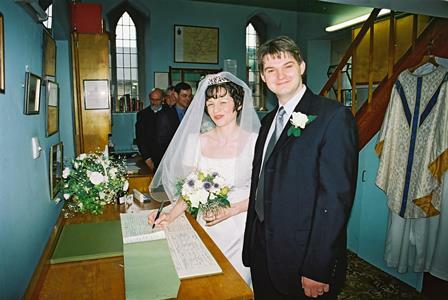 Rob’s mum was diagnosed with cancer early in my pregnancy, then an even bigger blow – Rob was diagnosed with cancer when I was about half way through my pregnancy. Rob was rushed into hospital and had his tumour and pituitary gland removed. I also became very ill and ended up paralysed and in hospital myself. 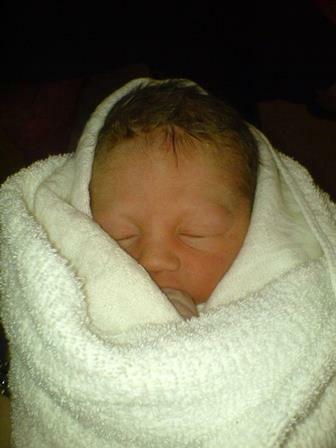 On February 5th 2007 I gave birth to a little girl, Emily Catherine: she was two weeks early and quite small at 5lb 8oz, but she was fit and healthy, and after three days in hospital we were allowed home on Rob’s 30th birthday. Having a new baby and a sick husband was very difficult, but we got through and the happiness at having our baby helped a lot. Rob started radiotherapy treatment in April 2007; the evening before his treatment started my grandma died. The treatment made him very tired, so it was a juggling act caring for Emily and both trying to get enough rest to cope. Thankfully Rob’s treatment and his mum’s were successful and they are both now free of cancer. Rob’s grandad was not so lucky; he was diagnosed with incurable cancer in 2008 and died within a few months. One of the last things he said was that he was proud to have known Emily. Rob has to manage a finely controlled medication regime, due to not having a pituitary gland (which controls many of the body’s hormones and other essential functions); if he is ill and not able to keep down his medication, he gets very ill and needs to be in hospital for intravenous medication. This has happened twice and is very scary and life threatening at the time. As well as the tablet he also needs a nine-weekly hormone injection, which I have to give him; I call it my revenge for all the ones he had to give me during my IVF treatment! Sadly, Rob’s cancer treatment means that he is now infertile, but we dearly wanted another child. He began hormone treatment, which took two years to produce a result. 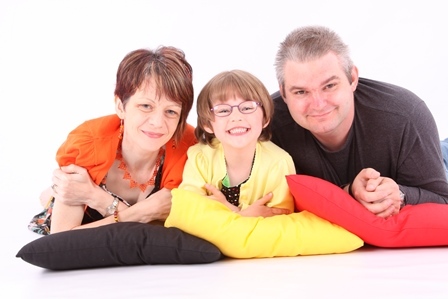 In February 2011 we decided to have another go at IVF, self-funded this time so a big decision and not one taken lightly. To enable us to do the main part of the treatment, which involves collecting the eggs from me (not a pleasant procedure), Emily went to stay with her grandparents for a few days. The timing was not good as it fell very close to Emily’s birthday, but it is decided by the menstrual cycle so you just have to go when its time. We got a reasonable harvest of eggs and went home to wait for the results and a date for putting the embryos back. Sadly, this never happened as none of the eggs fertilised – disaster, and the day before Emily’s birthday. Being so close to Emily’s birthday and just wanting to get her back home, we tried to put it behind us as quickly as possible. Last year we decided that we would like to explore further treatment with a sperm donor, not an easy thing to decide and another strain on the relationship. In the end we decided against it as it was too time consuming, expensive and a huge strain on my health, and most of all was taking us away from Emily. Emily would love a baby brother or sister and when she is older we will try and explain we tried our best. We also looked into adoption, but also decided that was not for us, as again it would have been very demanding and too much of a strain on my health. We have had a lot of family traumas through the year and many serious health issues that have put a huge strain on us all and on our marriage. Trying to balance family life, extended family and very fragile health is not easy and leads to many frayed tempers and we have at times got close to splitting up. Having M.E. does not get any easier and I struggle daily. I worry about the effect on Emily and try so hard to be a perfect mum. Emily is now six and understands things like I can’t walk far and I use a wheelchair etc., but does not understand the more subtle things like me being in pain or tired or not being able to be at her beck and call all the time and it does cause problems, but we plod along trying to make the best of it. I am trying to move on from wanting another child and put my little energies into other things whilst trying to make sure that I have time and energy for Rob and Emily; it’s a balance I often fail to achieve and get very upset about. Rob and I are currently seeing a marriage counsellor; it’s a good chance for us to talk without other interruptions and, with her guidance, stay focused on what we are discussing. It leaves me drained, but we are finding it useful and as it is during the day it does not have an impact on Emily, but does mean Rob has to juggle work. I feel very dependent on Rob for a lot of things and always want to try and manage things myself and hate asking for help. It’s not the best recipe for a relationship and leads to a lot of resentment on both parts. Our relationship has changed a lot as I think any marriage does; it is sad that the affection of early in the relationship has disappeared and sometimes it just feels like we share a house. We don’t sleep in the same bed: this is because I don’t sleep very well and Rob twitches and moves about a lot in his sleep, so rather than both be disturbed all night we decided to sleep separately. It is sad, but has probably saved our marriage and we all get a better night’s sleep, which has to be the top priority. All marriages have their stresses and strains and living as a couple and a family with an M.E. sufferer is a big strain and many relationships I know have failed. We have been through so much together; it does help to keep us going and to try and work out any difficulties. If you want to discuss any of these issues or just get in touch for a chat, please do not hesitate to contact me anytime. I also have a website called Crafty Jane's and I would love to hear from other crafters.